Advanced technology is uniquely blended in to the sleek design of the V3 Razr. This phone is even available in multiple colors and designs. The phones operates on either GSM 850, GSM 900, GSM 1800, GSM 1900, or GPRS band networks. 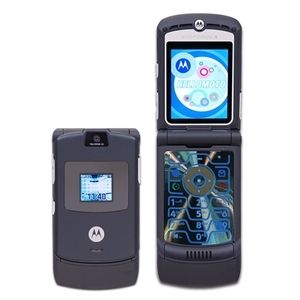 Like most other Razr’s, this phone is a clamshell, also known as flip, type phone. The stunning display has a resolution of 176 x 220 and features 65K Colors. There is also 5 MB of memory built in the phone for your convenience. You won’t find an antenna sticking out of this phone, since it is integrated. The Bluetooth feature on this phone also works very well. The digital camera gives you 4x of Digital Zoom. Message in an array of formats including SMS, MMS, EMS 5.0, POP3, SMTP, IMAP4 and Wireless Village Instant Messaging. Cool phone features include an Integrated speakerphone, iTap predictive text input, Photo caller ID, Voice dialing, Alarm clock, Calendar, Calculator, Currency converter, JAVA Applications and an external display. The address book can manage up to a whopping 1,000 contacts. The phone is incredibly thin, with a depth of just 1.4 cm. Accessories that you’ll find along with your purchase include Lithium Ion Battery, Travel Charger, Headset, Software CD, Belt Clip and USB Data Cable. From a Gadget Addicts perspective, this phone is recommended because of its overall capabilities and the good looking design it carries.